Which side of the “blue cheese” court do you fall on? Blue cheese definitely has its rabid fans and then plenty of people who just stay clear away. I don’t feel like I’ve ever spoken to someone who “kinda liked” blue cheese. Is it the mold cultures or distinct smell that people have a hard time with? Or just the strong taste? 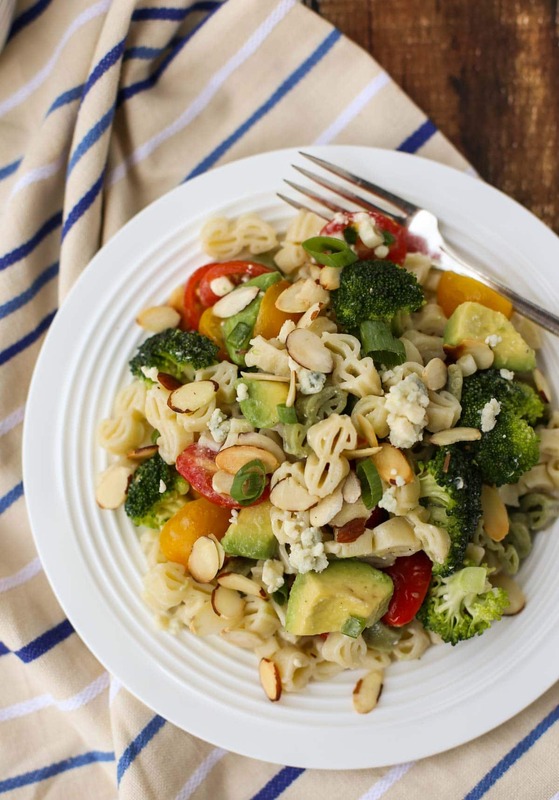 If you love blue cheese, then you’ll love this Blue Cheese Pasta Salad. But hold on…even if you’re turning up your nose at it right now…I’ve got a substitution that makes this recipe a winner for all! There are many types of blue cheeses. Some names you might be familiar with are Roquefort, Gorgonzola, or Stilton. These higher end blue cheeses are named from particular regions of their perspective countries and protected…kind of like the way certain wines are named and managed. Did I hear you think Chardonnay or Champagne? 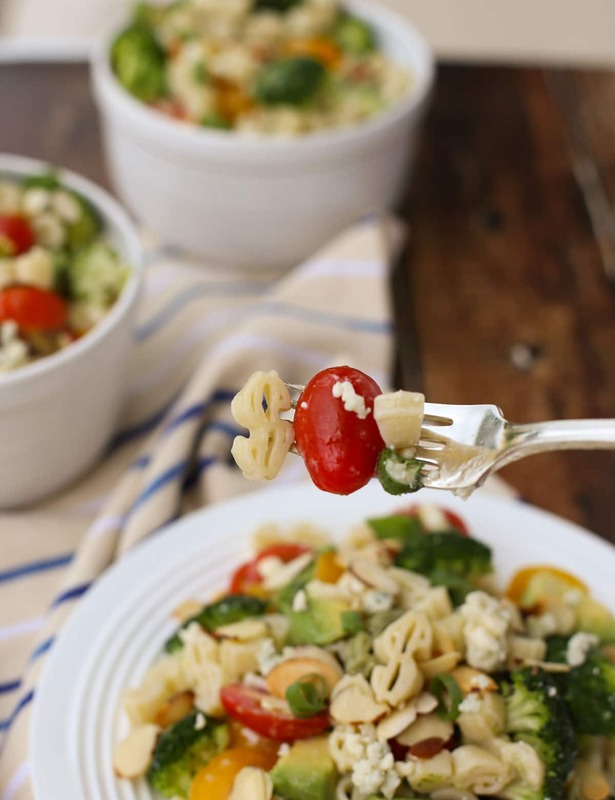 But if the thought of a strong blue cheese pasta salad isn’t for you, no worries. Here are two options: 1) substitute ¼ feta cheese and ½ blue cheese in the dressing. 2) Just use all feta cheese instead! Recipes are just a starting place for you to make them your own. Don’t be afraid to try a different version or ingredient. 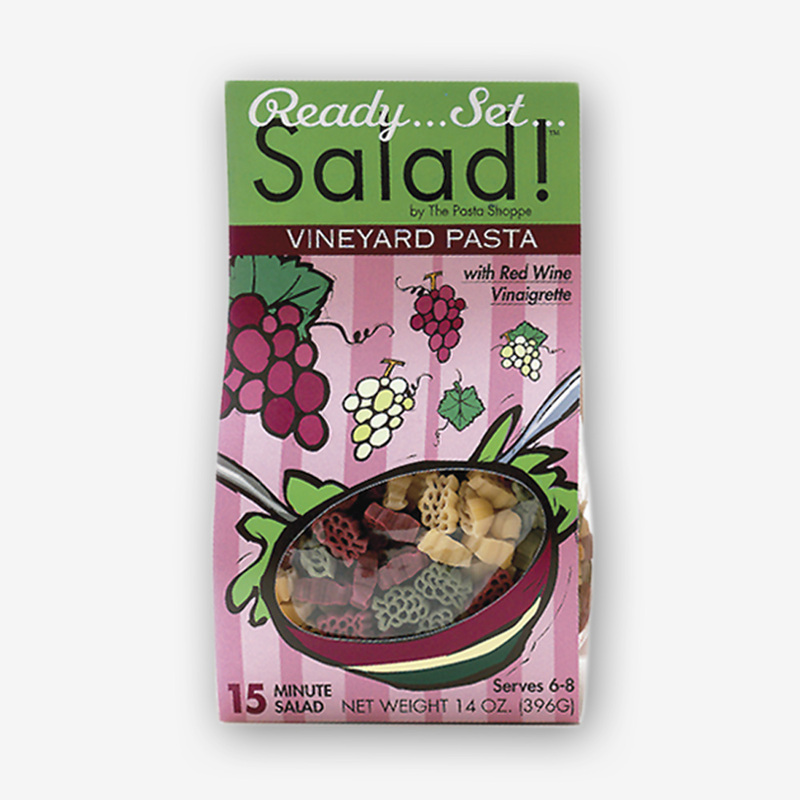 Especially with cheeses, nuts, vegetables or vinegars. 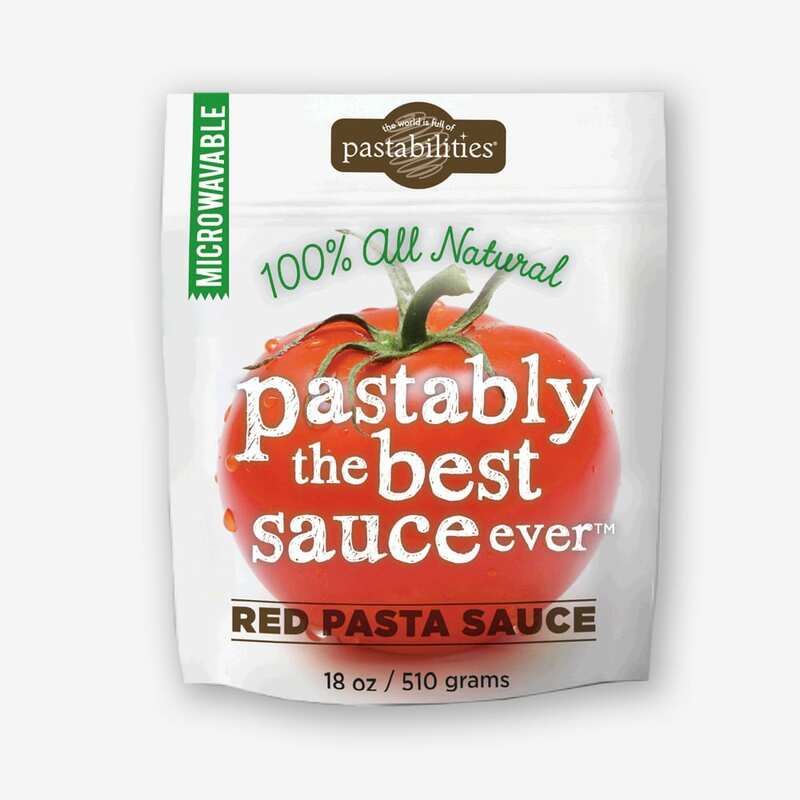 Sometimes it’s a necessity when that ingredient you knew you had “disappeared” when you opened your pantry. With this recipe, I ran out of red wine vinegar mid-pour, and just added additional white wine vinegar to the proper amount. Turned out great! 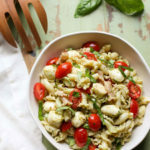 So if I still haven’t convinced you to try this recipe, then let me steer you to two other great pasta recipes that incorporate different cheeses, Fresh Tomato and Goat Cheese Pasta, and a recipe I recently featured, Tzatziki Pasta Salad. Enjoy! Also, I’d love to have you follow me on Instagram or Facebook! 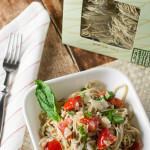 Let’s keep in touch about all things pasta…Ciao for now friends! Blue cheese lovers celebrate! 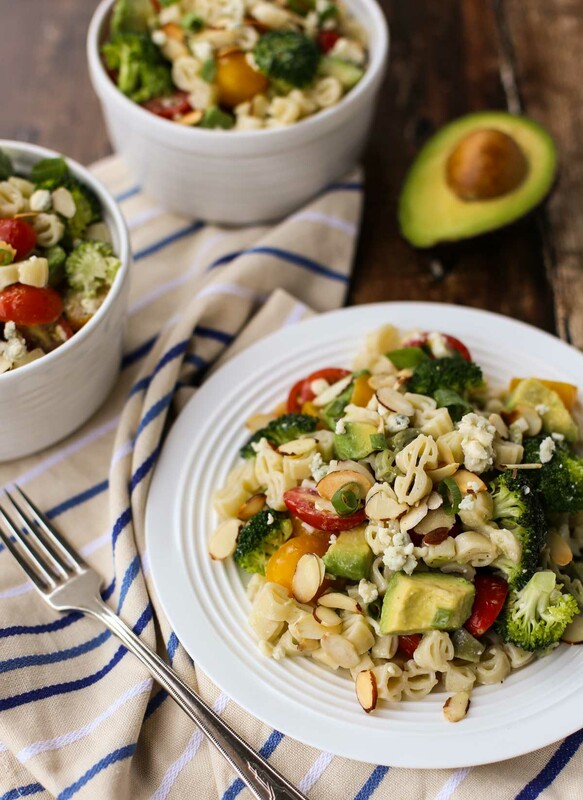 A blue cheese vinaigrette tossed with your favorite veggies: cherry tomatoes, crisp broccoli, avocado, and toasted almonds. For a lighter, less strong flavor, you can substitute feta cheese. Mix all dressing ingredients in a bowl and whisk until thoroughly combined, or place all ingredients in a mason jar or jelly jar with lid on tight, and shake until combined. May make ahead a few days and store in fridge. 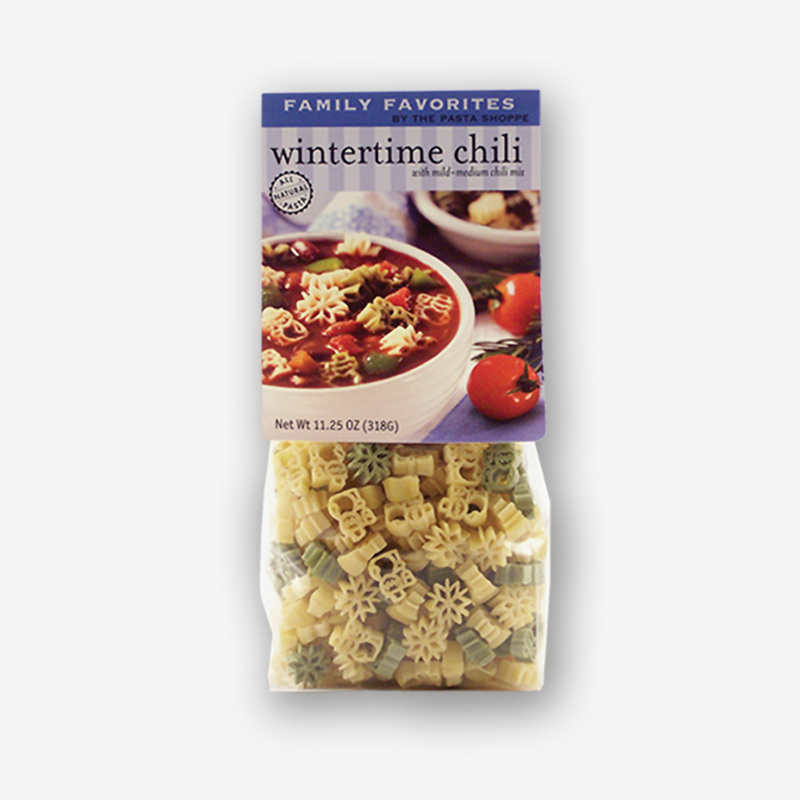 Cook pasta according to package directions, drain, rinse with cold water. 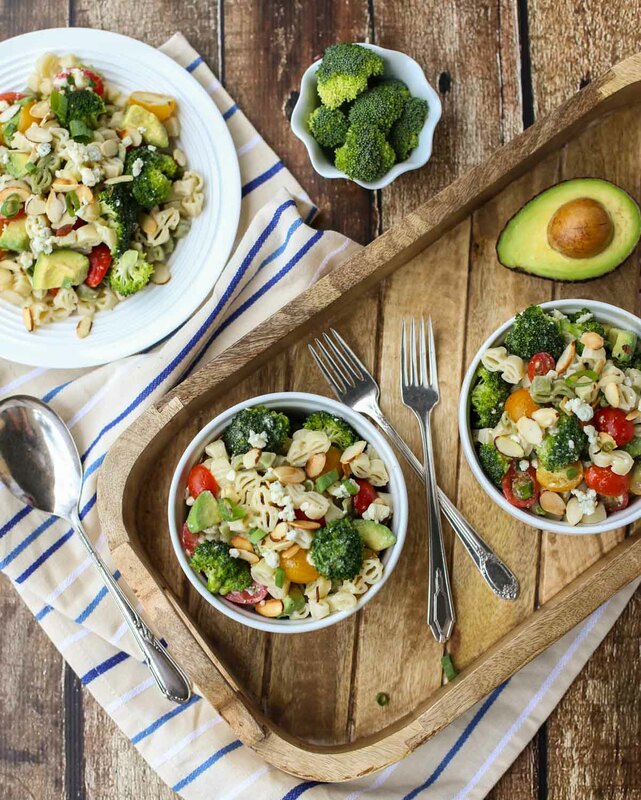 Combine pasta with broccoli, tomatoes, avocado, and almonds and toss with dressing. 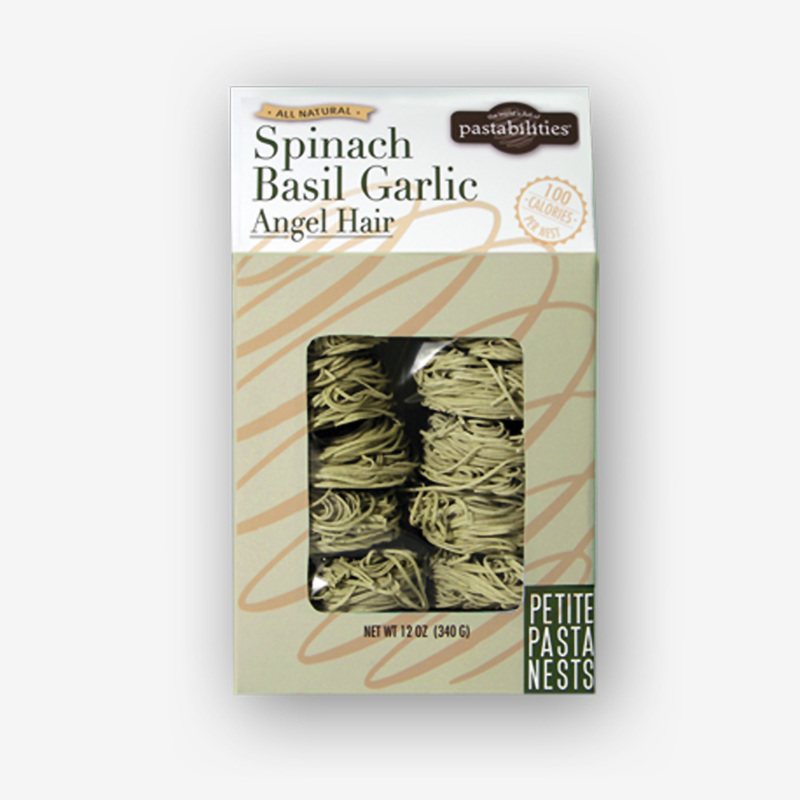 Serve and top with additional toasted almonds and fresh basil if desired. I love blue cheese! 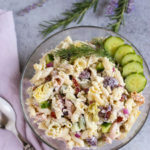 This pasta salad looks beautiful, and I know will taste amazing! Thanks for sharing. Blue cheese is my favorite! This is a fantastic recipe.